There are a number of Jaguar Restoration shops around the country, but regardless of how good they are, few have chosen to specialize in a single series of a single model spanning only 3 years. When it comes to Series 3 V12 E-type, there is one place, one man, that clearly stands head and shoulder above everybody else : Stew Jones Restoration in Winsted, CT.
Stew Jones started his business in 1976, handling various Jaguars from XK120s to Marks and XJs, in a large boat house on the the edge of the lake in Winsted CT., a neat little town nestled in foothills of the Berkshire mountains in the the north west corner of the state. There are no sign on the building, if you don't what's in there it probably means you don't need to know. Fast forward to 1984.... Stew Jones did a V12 E-Type restoration, a burgundy OTS which became a turning point in Stew's business as he then decided to focus and specialize on Series 3 E-Types. When asked why the V12 E-type, his answer was simple... " I just fell in love with the car". This car was in the shop when I visited, and it is indeed a very special car featuring among other things 6 webers carburetors . Since that car, which he now owns, Stew has indeed restored a number of V12 E-Types many of them winners on the JCNA circuit, others modified for competition. In 1998, he opened a 7000 sq. 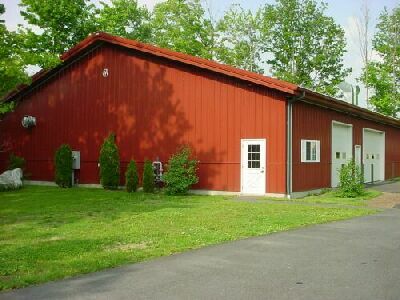 ft building across the street, the "dream of his life" which allowed him to invest in the very best equipment and tools. For bodywork, a special room with excellent lighting fixtures allows his body man, Tom Jones, to prepare the panels to perfection and to a state the factory in Coventry could never achieve. Next to the the bodywork room is a state of the art paint booth installed two years ago featuring a 10hp blower which is capable of renewing the air inside the booth every 20 seconds and 1.2 M BTU heater. This latest addition now allows Stew to control the restoration process from start to finish, all in house. Other equipment include state of the art computer controlled machining equipment, a rare factory engine stand for V12s and even a pizza oven ( to bake the finish on larger parts ). Over the years they have also developed some specialized equipment like special bonnet stands and even door stands. But the equipment is only part of the story and without Stew's knowledge, this would be just another well equipped shop. Over the nearly 20 years he has been specializing in Series 3 E-types, Stew has certainly become the leading expert on those cars. Having dismantled some 50 cars, and saved every single part ( mostly stored in a third building, a warehouse in nearby Torrington ), Stew and his crew have compiled books of notes they can use when completing a Concours restoration for which it is the details which will make the difference at the end of the season between 99.999 and 100 points. The amount of parts they store only for Series 3 E-type is such that when assembling a car they can just reach in own of the many shelf carts and get the right part, nut, bolt or washer, just like the chaps at Coventry did 30 years ago. The best way to appreciate Stew's work is to see the end results and of the most successful V12 E-Type in recent JCNA history is Terry Love's 1974 OTS, North American Champion in 2000 and 2001 Challenge Championship winner with a perfect 100 point score in Franklin where judging was particularly tough. Many of "his" cars often come back to his shop for service or to be "refreshed" after a couple of seasons, Terry Love's car wasn't there unfortunately but on that day, his shop had many interesting cars which really tell the story of Stew's passion. We started the visit at the boat house where a fully rebuilt and restored V12 stood on an engine stand ready to be fitted back in an E-Type : what a sight... That same car's rear suspension , , was sitting nearby, and although over restored to some extend, it was just magnificent. The main room next to the bays contained some fabulous Jaguars , not all E-types as Stew still has a few faithful customers with other Jaguars; and he has also accumulated a few special cars long the way. Mark IX, XJ6, were some of cars there but also that white OTS Stew restored in 1984 and made him fell in love the V12 E. Another roadster stood out because of the impressive 17" Dayton wire wheels and low profile performance tires. Sitting next to it was another V12 engine , 6 liters, 6 Webbers, fully prepared, featuring twin crank sensors to fire the coil pack ignition, clearing the valley of the distributor. Crossing over to the new building, we were met by a fascinating number of special cars and projects in various stages... First was one of Stew's own car, a rare factory 5 speed 1980 XJ6 , , which is one the very few such cars in the US with a clear title as they were never imported. It turned out to be a Dutch market car, left hand drive, imported in the US by an Egyptian diplomat who later sold it. In 1988 that second owner placed an ad in a local paper which of course caught Stew's attention and he didn't waste any time buying it... Currently the car is driven by Stew's wife Karen in JCNA slalom events where it is very competitive. In addition to the 5 speed manual, the European specs include 3.54 limited slip diff., bumpers, 9:1 compression along with different fuel, exhaust and emission systems. Next to it stood another an XJ, a Coupe being re assembled, and another interesting story as they had originally rebuild the car using a supercharged AJ16 engine from a 96 XJR. Even though everything fitted and the car was actually test driven, Stew didn't like the weight distribution and actually decided to pull the engine out and re fit the original XK engine... talk about the pursuit of perfection ! But that day, the centerpiece of Stew Jones Restoration was a special roadster currently being built for JANE member Jim Roberge for slalom, autocross and other track events. To say that this roadster is special is an serious understatement... After disassembling the car, they put the shell in an oven and cooked it for 4 hours at 600 deg. to burn the large amount of bondo they found along with the lead filling. I asked Stew about the lead Vs fillers dilemma and he told me that he prefers using plastic fillers which when properly used are superior to the old fashion lead techniques. The shell was then brought back to Stew's and placed on a rotator giving full access to every part of the shell. Because of the type of event the car will be used for, the shell was extensively modified and reinforced to provide the most rigid platform, critical for handling. Reinforcements were added under the cowl (below the windshield) and also behind the seats with integrated roll bars. Further back, heat extraction ducts were added from above the rear suspension and vented outside to the license plate area . 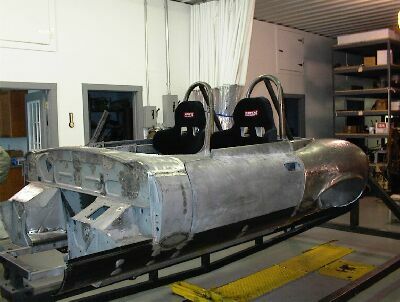 The front sub frame assembly was next to the car and it was clearly not stock... using the very same tubing material as originally used by the factory, Stew's welder reinforced the stock frames by adding braces and additional members to provide an ultra stiff platform for the suspension to do its work. The rear suspension was also extensively modified to allow the use of 11 " x 18" wheels fitted with 305/30/18 tires. Up front, 10" x 18" wheels fitted with 275/35/18 tires will be used providing a tremendous amount of grip n corners. 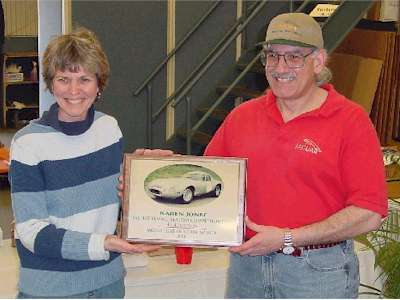 Above :Karen is being presented with her award by Harold Kritzman of the Jaguar Club of Southern New England. 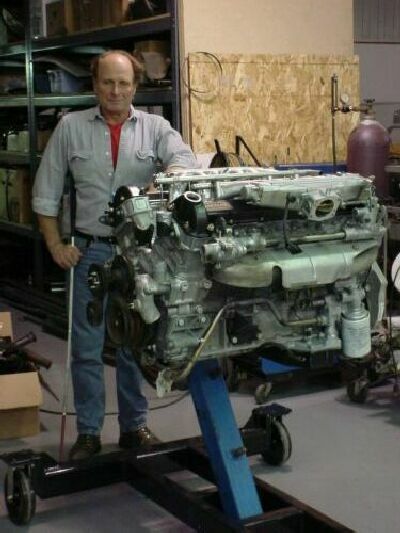 Below : Stew Jones standing next to a V12 engine, on a rare factory engine stand. Under the bonnet the car will be powered by a 1994 6 liter V12 rebuilt by Rob Beere Racing in the UK; Stew explained that he didn't see the need to reinvent the wheel and preferred using the services of one of the best race engine expert in the world and benefit from their experience. 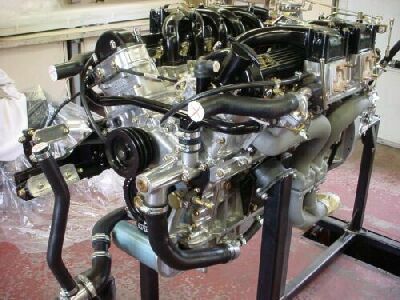 Engine is largely stock except for Webbers carburetors and headers and will be matted to a Getrag 5 speed gearbox. When completed, this car will be painted Silver and will retain the stock appearance of a V12 Roaster with most of the modifications being internal and very little flaring needed to accommodate the rear tires. It will be a very serious contender at JCNA slaloms... stay tuned ! If Stew Jones is the expert for putting together Concours champions and fierce Slalom pavement shredders, his wife Karen puts those skills to good use when it comes to driving around cones. Not only she is a regular competitor in JCNA Slalom events in the Northeast but,as of 2001, she is also the fastest woman on the course with a time of 43.41 sec.